Repair Fitting for 3/8" Transmission Line. 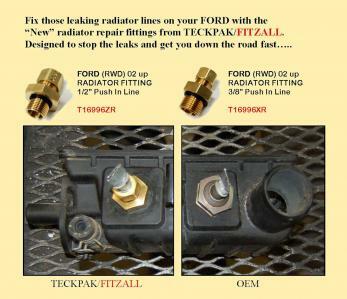 Designed to replace leaking cooler line fitting located at the radiator in 2002-up FORD Explorer / Trucks with metric threads into the radiator. Thread Size 18mm x 1.5 (male) to 3/8" Tube - Compression (female). NOTE: Some late '06 and '07 model vehicles may have SAE size threads.